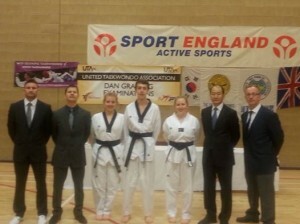 The United Taekwondo Association held its April Dan Grading at the Wallace Centre, Stoke on Trent. Clubs and Students from Stoke, Manchester, Milton Keynes, Northern Ireland, and Scotland were all in attendance. On the panel were Master Glen Culbert 6th Dan – UTANI Northern Ireland and UTA Committee Member, Master Peter Johnson 7th Dan – UTA Vice Chairman, Master David Bailey 7th Dan – UTA Secretary and Grand Master T W Shin 9th Dan and UTA Chairman. This is the highest graded Dan Panel in the Country and the most experienced . Students were grading from 1st Dan up to Third Dan and the standard was exceptional. All students had to perform stepping/movement techniques down the hall forwards and backwards! Then any technical hand techniques down the hall forwards and backwards. Then sport fighting kicks down the hall and counter kicks attacking and evading. Then each student had to perform basic poomsae kicks down the hall. Then three poomsae. Each student had to perform the one for their grade the one below and any kup grade poomsae picked at random from one of the Masters. After this they had to perform one step sparring using varying hand and foot techniques with a partner, then with full protective kit full contact sparring to competition level. This was then followed by destruction jump back kick, jump spin back kick jump spin hook kick on breaking board and wood. 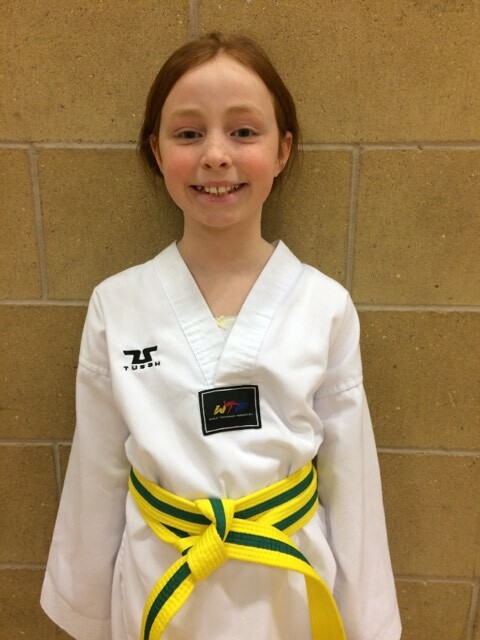 The grading was the finished off by a 1 hour written test on the knowledge of Taekwondo a 75% pass mark required on this test. The UTA grading is one of the toughest in the world and students who complete this and are successful are truly deserving of their black belts and have definitely earned their grade! This entry was posted in Club News, Events on April 13, 2014 by Peter Johnson.